Grand Strand Baptist Church | Second Avenue Pier, Myrtle Beach, SC at 6:45 a.m. Faith Presbyterian Church Easter Sunrise Services is on the beach at 79th Avenue North. Bring a blanket or folding chair if you don’t wish to stand for the service. A special breakfast buffet will follow at the church. Christ United 6:30 a.m. sunrise service on Easter Sunday outside at Bummz Beach Cafe. Please bring a chair if they do not wish to stand. A continental breakfast will follow service. Murrells Inlet Church of God has a sunrise service on Easter Sunday at 7 a.m. A cantata will follow at 11 a.m.
Shepherd of the Sea Lutheran Church service will take place on the beach at 6:30 a.m. with a pancake breakfast following. Trinity United Methodist Church service will be held Easter Sunday on the beach at 17th Avenue South. Please bring flowers and lawn chairs for the service. Ocean Creek Resort Brunch will be served at 11:30 a.m., 2 p.m., and 4 p.m. The buffet includes a variety of salads and appetizers, carved top sirloin, peel & eat shrimp, chicken, fish and more! Price is $28.95 for adults; $14.95 for children 4 to 12. Reservations are required. Call (843) 272-7724 Ext. 1010. Sea Watch Resort Meals will be at 11 a.m. and 12:30 p.m. at Captain’s Cove Restaurant and include a variety of salads and entrees, a carving station, and desserts. Price is $27.95 for adults and $13.95 for children 4-12. Beach Colony Easter brunch with the Easter bunny, will be from 11 a.m. to 3 p.m. April 1. The buffet includes glazed ham, salmon, and roasted pork along with a number of sides, salads and desserts. Price is $19.95 for adults, $9.95 for children 4-10, and free for children 3 and under. No reservations needed. Beach Cove The Tradewinds Cafe inside Beach Cove Resort will host an Easter buffet from noon to 4 p.m. on April 1. Selections include a variety of salads, Southern-style entrees, and desserts. Price is $21.99 for adults; $10.99 for children 4-12; and free for children 3 and under. Military members dine for $15.99. Reservations suggested. EdVenture Myrtle Beach: (formerly the Children’s Museum of South Carolina) will host an Eggstravaganza from 9 a.m. to 5 p.m. March 31. Kids can meet the Easter bunny, hunt eggs in an indoor egg hunt, and enjoy many crafts and activities. Admission is $5. McLean Park Easter Egg Hunt: 10 a.m. Saturday, March 31. Egg hunts will be divided according to age groups and refreshments will be provided by the North Strand Optimist Club. Bring your camera for photos with Ms. Blossom. 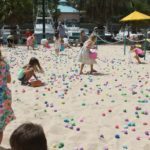 Surfside Beach: The town of Surfside Beach will host an Easter Egg Hunt and children’s festival from 1 to 4 p.m. March 31. Come join LuLu’s North Myrtle Beach in their first annual Easter Egg Dash! The Easter Bunny will be on hand for photos and to watch the kids DASH! for the Easter Eggs that are filled with toys, candy and special GOLDEN EGGS with discounts to the restaurant and gift shop! No matter what LuLu’s does, they do it 100%. Every event I have gone to the staff has been great and I’m sure the Myrtle Beach Easter Egg Hunt will be a lasting memory. See 2 bedroom Oceanfront South Hampton 1109 in the Kingston Plantation for a place to stay. Your day has started | Enjoy everything Myrtle Beach has to offer. One of South Hampton pools just steps from our unit. Beautiful Sand Dunes Outside Our Unit. Take A Walk On The Walking Path Past Lagoons, Beautiful Landscaping And Wildlife.